I go grocery shopping once every two weeks. I wish it were more often; my most favorite place in the world is strolling the aisles of international sauces, bulk whole grains, and smelling produce to bring home with me. Forget new shoes or clothes, give me groceries! Roasting is super easy: Cut the squash, clean out the seeds, drizzle with olive oil, salt and pepper, and roast at 400F for an hour. 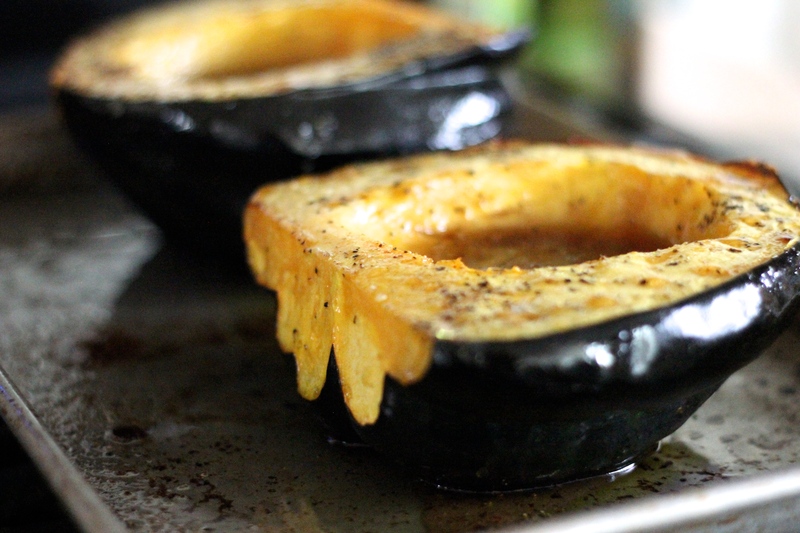 I added a drizzle of maple syrup with this squash. Pull together the stuffing in a pot while the squash is roasting, and you’re good to go. Heat oven to 400F. 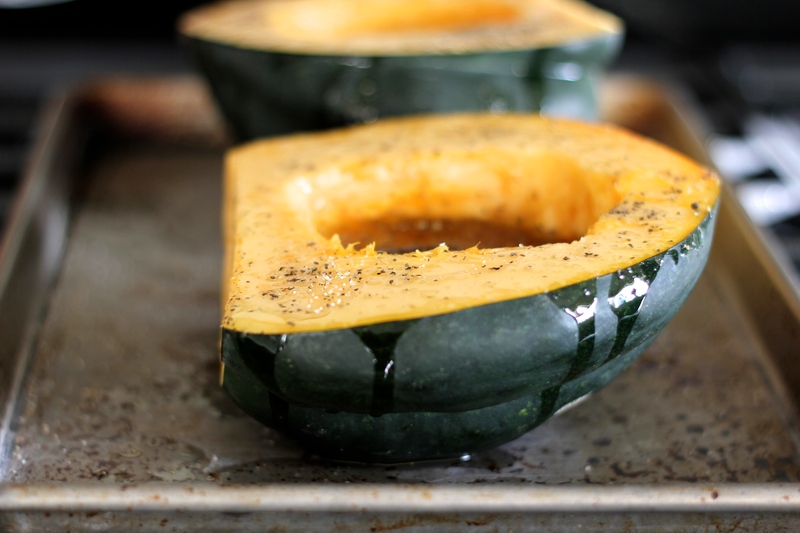 Prepare acorn squash on a baking sheet: Drizzle with olive oil, divide the maple syrup between the two halves, and sprinkle with salt and pepper. Roast for at least 1 hour. If the squash is very thick, it may take longer, just watch it. The squash will be soft and golden brown when it’s done. While the squash is roasting, prepare the stuffing. Coat a large pot with olive oil and heat over medium high heat. Sauté the chopped carrots, celery, and onion with salt and pepper to taste. When the onion is translucent, add the lentils and sauté for another 3-5 minutes. Add the vegetable stock, apple, and craisins, and let come to a boil. Lower heat and let simmer for 15-20 minutes, until the lentils are tender and all the stock has been absorbed. Off heat, add the garbanzo beans, breadcrumbs, and mixed greens, and stir until well combined. Cover with a lid and keep warm until the squash is done. 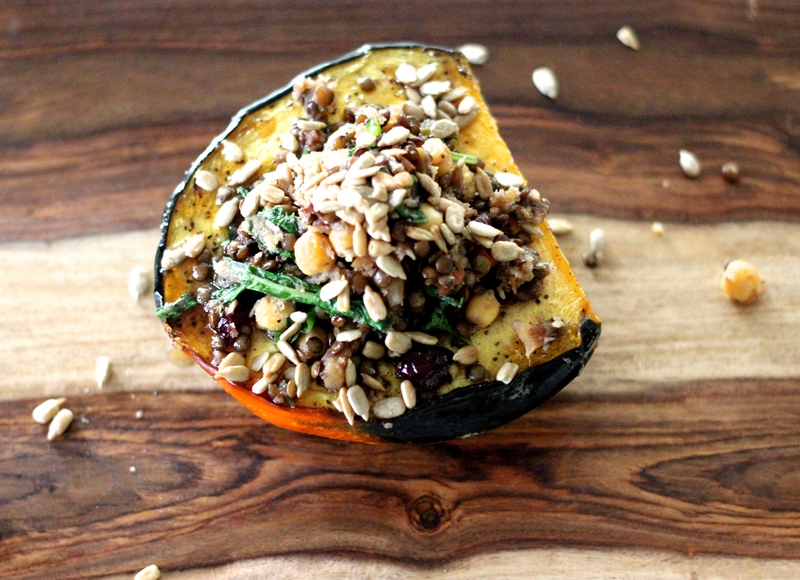 For 2 servings, this will be a meal, just fill each acorn squash half with the lentil stuffing, sprinkle with sunflower seeds, and serve. For 4, this will be side-sized, and will be great served with salad or soup. Just cut the acorn squash into 4 equal portions and divide the lentil stuffing evenly. 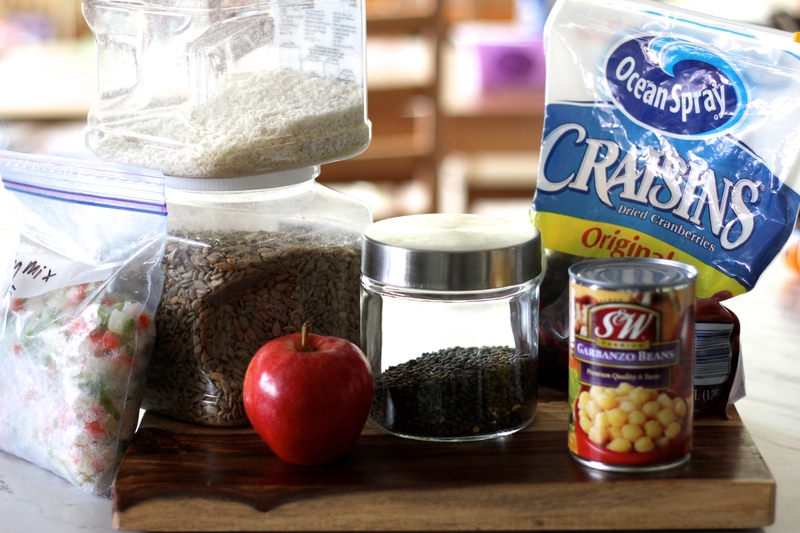 Sprinkle with sunflower seeds and serve. < Previous What Do I Do With ALL THOSE BEANS??! !